The Michigan ACEs Initiative is a state wide effort to create awareness in communities across Michigan. The Adverse Childhood Experiences Study demonstrates the correlation between toxic doses of stress hormones in childhood and health outcomes both physical and mental. 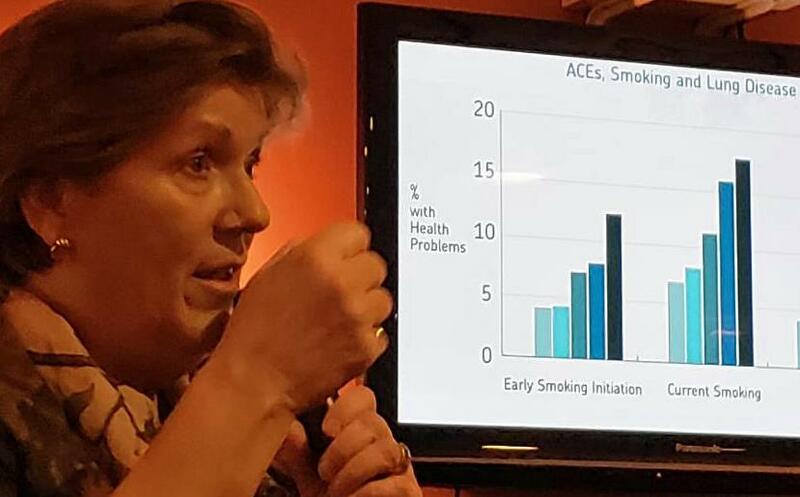 As an ACEs Master Trainer Mary Gruman, our speaker today, is charged with bringing this science to decision makers in the hope of creating collaboration to reduce ACEs. Research has established the impact that Adverse Childhood Experiences (ACEs) have on both long term behaviors (lack of physical activity, smoking, alcoholism, drug use and missed work) and physical and mental health issues (among them severe obesity, depression, cancer, stroke and suicide attempts). The ACEs include Abuse (physical, emotional, sexual), Neglect (physical, emotional), and Household Dysfunction (mental illness, mother treated violently, divorce, incarcerated relative and substance abuse). The more such ACEs, the higher their ACE score. ACEs are more prevalent than might be realized with 64% of the population experiencing at least one and 21.9% experiencing 3 or more. The result is stress hormones that prevent a child's brain from developing fully. The last part of the brain to develop is the frontal cortex that controls executive or sound decision-making. This can make them hyper-vigilant, edgy or emotionally detached. The higher their ACE score, the greater their chances for health problems, alcoholism, smoking, COPD and anxiety. A person's ACE score cannot change; it is the sum of their adverse childhood experiences. However, a person with a high ACE score can be buffered or buoyed by others with lower ACE scores. What can we do? Provide relationships that are caring and competent. Our STRIVE program is a great example as are the mentoring programs underway in BCS elementary schools. Awareness also helps, and that is one of Mary's goals. Mary also shared a short film on epigenetics, the study of changes in organisms caused by modification of gene expression rather than alteration of the genetic code itself. Can the adverse experiences of a child ultimately be passed down to their offspring?